News broke yesterday that the Patriots were set to meet with defensive tackle Nick Fairley, adding another wrinkle on top of what’s already been a pretty busy month for Bill Belichick and Co.
Having already completed a litany of moves, highlighted by the signings of Chris Hogan, Chris Long and Donald Brown, the trade of Chandler Jones to Arizona and the trade for Martellus Bennett from Chicago, the Patriots apparently aren’t done looking to add, and Fairely could be the next piece brought aboard. The 6-foot-5, 308-pound lineman was the 13th overall pick in the 2011 draft out of Auburn, and after spending four years in Detroit he signed a one-year deal with the Rams last summer. 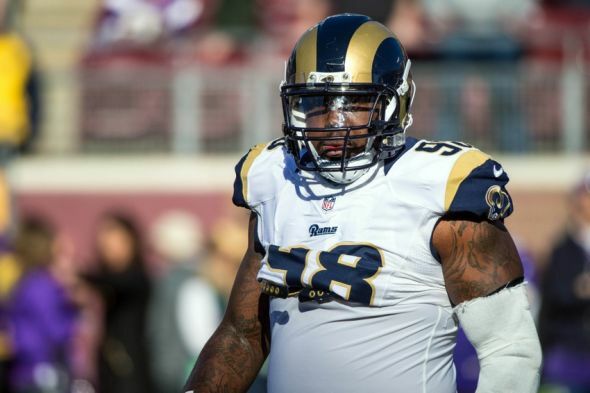 Fairley’s struggled to stay healthy throughout his career, as a knee injury ended his 2014 campaign after just eight games while a late-season concussion prevented him from playing a full 16 games this past year. And on top of that, Fairley’s numbers won’t blow you away, either. He’s recorded just 1.5 sacks and 43 combined tackles the past two seasons, but the Patriots wouldn’t necessarily be bringing him in to rack up huge totals. Fairely has been used primarily as a space-eater due to his ability to disrupt the offensive line and open up holes for his teammates, and Pro Football Focus rated him as the 23rd best defensive lineman of over 120 qualified players in 2015. Fairely would join the group of Dominique Easley, Malcom Brown and Alan Branch in a rotation, and there’s a need for some size and girth in the middle of the line. If Belichick can bring him in on the cheap, it’d be yet another scenario where he puts a veteran player in the best position to succeed and maximizes his talent (we’re already in for one this season with Chris Long, Fairley’s teammate last season). Fairely has also drawn interest from the Saints, Eagles and Jets this offseason.